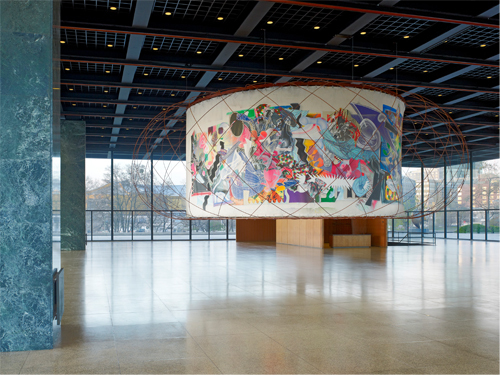 Upon approaching the renown last building by Mies van der Rohe, a distinct glass pavilion supported by the German architect’s signature grid of steel beams, one immediately is captivated by the massive caged painting that hangs roughly seven feet from the floor. The structure, a collaboration between Santiago Calatrava and Frank Stella, is at once imposing and sublime. The neon colors of the 98 foot mural immediately jump out and clash against the surrounding stoic tones, while the gridded donut enclosure acts as an update the stagnant flat grid of Late Modern architecture. The collaboration between these two acclaimed figures manifests as an attempt to create a visual narrative within the space that traces a route from the Modern to the Contemporary. 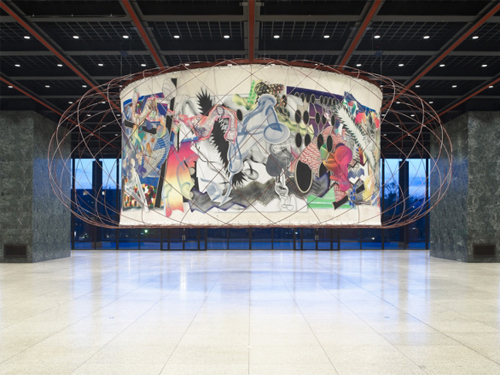 The Curtain certainly takes cues from early 20th century murals, but instead of opting for a figurative approach, this collaboration tells an abundantly abstract story of the reciprocating influence that painting and architecture have had upon one another, as well as point toward a vivid future where both disciplines can merge into one grand gesture. 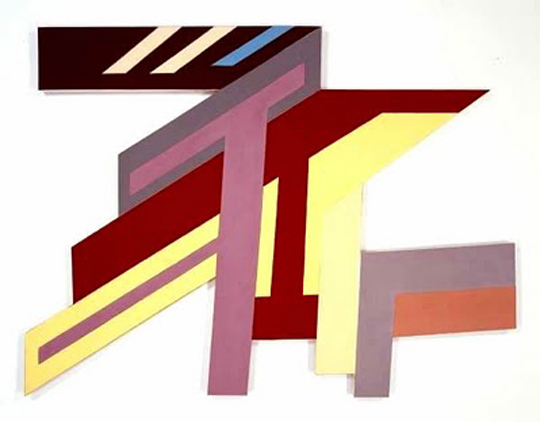 Although Stella’s work appears flat from a distance, closer examination of the structure reveals a vibrating surface that contains multiple layers and shapes that could be mistaken for onomatopoeia bubbles found in comic books or default software paint brushes – a gesture that speaks as much to PaintFX as it does to the legacy of Roy Liechtenstein. Amidst all of the organic forms, and their inorganic color schemes, glimpses of a comment on the bravado of architecture peak out intermittently. 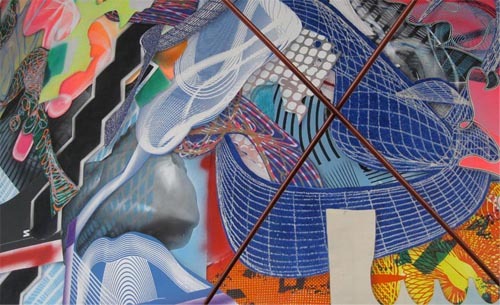 Warped gridded lines move along the mural in strokes that begin to resemble columns. The shapes that undulate beneath the top surface reference mechanical floor plan drawings, or else borrow from a palette familiar to anyone who has worked with a CAD process. But as quickly as these nods appear to the viewer, they recede just as rapidly behind gradients pulled from the look of an 80s air-brushed billboard. As one walks around Calatrava’s encasing web, one begins to see how his contribution acts as a counter swing in the pendulum that is this monumental work. 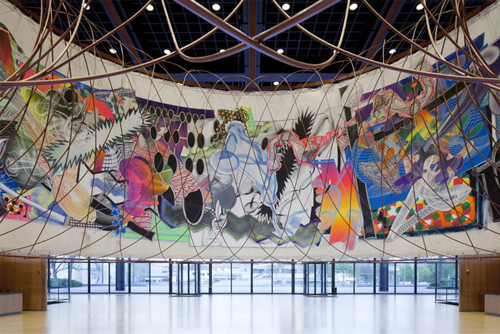 The visual simplicity – but technical complexity – of the apparatus that holds together Stella’s mural exemplifies the desire that Yoshio Taniguchi stipulates for contemporary architecture to not just envelope, but to eventually “disappear.” The criss-crossing array certainly adds a sculptural component to the Curtain, but it also serves a purpose akin to the bridges that gave Calatrava his name. The frame in this collaboration creates a similar surface/space in which to transport and traffic mobility, but instead of cars being the primary vehicle of movement, Calatrava instead directs our eyes. The uniformity of his ornamentation creates a even distribution of attention along the chaotic scramble of Stella’s scribbles and loops. The impact of the Curtain is undeniable, given its presence in the space, its resonating colors, its complex construction and installation, its ambition, and its balance between the baroque and the minimal. The collaboration between Calatrava and Stella is perhaps most successful due to the surprising reflexivity that emerges from the work as one navigates its density and observes the elegant meditative spaces resting between surface and structure. Mark Amerika and I corresponded over the past several weeks while he has been jet-setting over the western hemisphere promoting and sharing ideas behind his recent University of Minnesota Press publication remixthebook. We discuss below, in a univocal, non-hierarchic, feedback looped way some of the tenants and relevancies of remix to post-studio/post-production art practices. I’m especially keen on the blurred lines of authorship that we have undergone as a result of wanting to continue the conversation Amerika puts forth in his writing. Our effort to synthesize voices in relation to our individual perspectives on remix act as a performance of identity that often gets manifested through the mechanisms of social media and networked culture. The repartee below offers a stream-of-consciousness glimpse into a perpetual state of curiosity and subversion of the self that remixthebook confronts, wrestles, and plays with. This interview came at a timely moment as well since I acted as a micro-blogger-in-residence for the remixthebook twitter feed. I’ve also put some thoughts down about remix in relation to my own visual/creative practice for the publication’s blog. Why is remix relevant for you right now? I mean, if we look at the history of remix, do we not see a diversity of methods that are employed across a wide range of practices and disciplines, everything from Cubist collage to Rauschenberg’s combines, to the cut-up technique of Brion Gysin and William Burroughs, to Situationist détournement, OULIPO styled proceduralism, appropriation, DJ/VJ culture, plunderphonics, codework, what Bourriaud refers to as “postproduction art,” and of course the whole mashup scene on the Internet and beyond? Do not all art methods at some point relate back to what you call remix? Isn’t it almost like asking what does it mean to dream? Because in a very real sense, navigating through remixthebook, which is both a print book AND a work of conceptual performance art AND a website composed primarily of other artists and writers sampling source material from your writing and postproducing it into new iterations of performance theory, the question you seem to be asking is what is NOT remix? And if EVERYTHING is remix, would it not be the job of the contemporary artist to take what media culture has made common, in this case the act of remixing our identities for us, and destroy it from within? Or is that reading into it too much? Perhaps it’s too romantic a notion, one that once again positions the artist as a cultural outsider and what we really need to do is to investigate how remix opens up The Total Work as a collaborative, ritualistic daily practice? What would a remix of the Gesamtkunstwerk look like? How would this collaborative ritual of remixing everyday life, something that de Certeau addresses in a slightly different way, be situated inside the history of the avant-garde? In remixthebook the idea of an artistic and literary avant-garde almost disappears since everyone is doing it which then challenges the 2.0 crowd to ask ourselves can a vanguard art scene even exist in social networking culture? Perhaps we need to look at the various contemporary approaches toward what Duchamp refers to as The Creative Act — but that you see as The Act of Remix — and put them in their proper cultural context? In this regard, maybe what you’re doing is turning theory into a social media art practice that has its roots in conceptualism but is really not that either because of the way you confuse or problematize this whole issue with the body? That part in the book about the legendary Bruce Lee, and his book Artist of Life, and his take on Gestalt Therapy? I guess you see him as remixologist too? Didn’t he Chop and Screw? That brings up another important question: which remixologists are influential for your own practice? Or is it even necessary for artists to address that question? I’m thinking here specifically of that passage in the book where you write about how “we don’t even need to be aware of our past influences … they reside in the body like second or third or fourth nature / something that enables us to play ourselves without having to think about it”? I also wonder how this book, if we can even call it a book, especially since so much of the content is created by others on the remixthebook.com website, situates itself between the “trickle-down” of high-art and the “bubbling-up” of low-art? Obviously this dichotomy cannot sustain itself any longer, but is there a location within that spectrum that you’ve decided to build an outpost in? You say that these influences from the bodies of work postproduced by others are IN you in a way you have no control over and that it’s really a matter of mirroring neurons which is an interesting use of neuroscience because I know that in your recent keynote at that big symposium in Rio de Janeiro you were trying to suggest that this relational agency that makes daily remix practice even possible, on a base creative level, or a biological level, also takes place in social networking culture too, and that we are just now learning how to show empathy or respond to the “actionary” agenda of the others we engage with while on the Internet, yes? Because this intersubjective jamming among the digital personae who play themselves on the Net is also a kind of social or emotionally engaged remix, right? And of course this intersubjective jamming is not limited strictly to the social networking protocols of the online junkies getting their next hypermediated fix, in fact — where is the Net in our everyday physical performance of self? How have we augmented ourselves to a point where the biological self can be irrelevant to establishing creative identity? The word you use is copoietic, which I think you sample from Bracha Ettinger, yes? You seem to be asking how we might consider the historical trajectory of various remix-related art practices themselves as source material to reinvent what it means to a social agent, but to do it as part of some ritualistic, boundary-blurring art/life practice where the social networker exhibits their performance art in the field of digital distribution, right? I guess a question all artists, those who identify as such and not, would be how does remix infiltrate your work? If we can assume that are creatively invested in acts of perpetual postproduction, then when does the ingenuity or initiation of a mix start and end? When does the metaphorical record change, the cross fader cut, the midi-controller nob turn, the splice interrupt, the click trigger? Can language even do this subject any justice? What other metaphors can be used to discuss remix that don’t rely on the rhetoric of the turntable or sound engineering console? Because in the book you suggest that we are always sampling from the Source Material Everywhere and yet this also then brings up the question about whether anything is outside the boundaries of being considered remix? Can we ever just wake up and consider ourselves off the remix grid? Especially given the fact that when the grid is encroaching upon biological realization, how does one unplug? Or is it a permanent condition that we’re wired to deal with as part of a this daily, ritualized practice, i.e. the so-called practice of everyday life? It’s as if we can never get away from it … for example, could not this dialogue we’re having right now also be a remix? The language is so fluid and malleable on the screen either one of us could be typing these words, no? Isn’t language, as the foundation of technological society, already a hack, a remix, a short-circuit of our biological selves into virtual experience? This makes me wonder: how do collaborations influence remix? And also, how can young artists continue to engage in radical transparency without forsaking their identity being consumed by mass culture? That may seem out of the blue, but if you think about it, given all of the data mining and how Google and Facebook now pretty much OWN our data which they would love to monetize without us even knowing it, I guess what you’re saying is it’s up to the remixologist to creatively intervene in their own identity construction and the best way to do that these days is to actively manipulate their data into a simultaneously and continuously shifting version of themselves? This would then be a kind of conceptual performance art project, yes? A post-studio, post-personae creative research practice? And a metafictional process too, right? Aren’t you suggesting that by manipulating the metadata that informs our online identity we need to convert the act of remix into a kind of auto-fictionalization process that morphs identity at will? But would that not do a disservice to any potentially genuine forms of communication? Two-wrongs make a right? Would physical, non-screen, remixes help mediate the tension of the over-performance of self as a shape-shifting fiction-in-the-making? Maybe we could read remixthebook as another one of your fictions? Like your novels? What’s the difference? Is it all part of the same remix of an impermanent state of being? But can we get back to network culture specifically? Because I’m curious, can we distinguish network culture as an aside or subset of (mass) culture? How is network culture providing the context for auto-remixology? How does identity get remixed through the variable contexts of network culture? How do we develop versions of ourselves – alpha, open/closed beta, release candidates, RTM, General Availability, sustained support, End-of-life (all terms borrowed from the software industry) – based on a combination of personal drama and creative meta-fiction? Are you suggesting that we can literally immerse ourselves in actionary (to sample Paul Miller’s phrase), practice-based art research that borrows from appropriation and remix and postproduction art and out of this immersion build a performance personae that has its ancestral roots in the lineage of canonized art history? And what about narrative? Or else furthering the “progress-march” of the canon? In its written form, remixthebook is really about storytelling, yes? Is creating a narrative of remix – historically speaking – important for remixologists? How do we circumnavigate that linearity? Or is it not really about linearity at all but a kind of simultaneous and continuous fusion of the moments that were never meant to be but get documented as a formal trace left behind nonetheless and that we then are trained to read as narrative? How do we avoid the “old-trappings” of making contemporary art that looks too familiar as contemporary art? How do we borrow from art history without romanticizing it? This begs even more questions: how does time effect/affect a remix? How does space effect/affect a remix? What are the physical limitations of remix, if there are any? Or else how does a remixologist play between their activities and performances on or within the screen and in physical manifestations? You must have had this feeling of co-existing in different mediated and embodied spaces while performing your live VJ sets around the world, yes? But even so, ARE there boundaries and limitations to remix? What are some of the fundamental foundations for a successful remix? Do remixologists even need to be concerned with success per se and what would the criteria for a successful remix be? 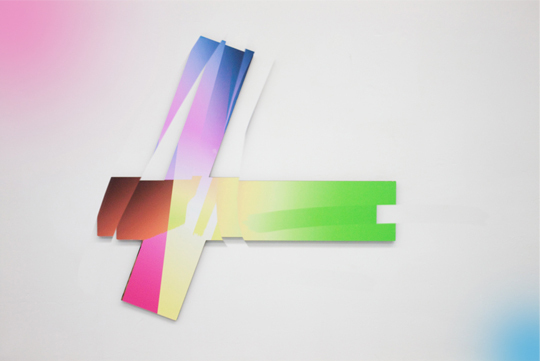 Who determines what does and doesn’t have value as a form of remix art? And finally, what does remix have to do with craft? Or even better, what does craft have to do with remix? And when did remix “come to you?” Or, as you suggest in META/DATA, your prior book of contemporary art theory, are we actually all born remixers? The representation and exhibition of digital or computer based works in the gallery is no small task for today’s young contemporary curator/gallery manager. Without even considering the surmounting cost that it would take to show media work at the level of a major institution, the mere spatial concerns that these works present is reason enough to give one a headache. Some, like Barmecidal Projects (a project I’ve written on recently), have obviously taken to a purely digital approach of exhibiting online works not just for economic reasons but also to act as diametric counter points to the physical demand of the art world. But even as these projects become more appealing and gain notoriety for their alternative approach to showing young work spawned from the Internet, they still do not necessarily solve any problems for those that wish to bring this work into dialog with more “traditional” mediums (I should stress that I’m not being pejorative here, as I typically would). One cannot expect such demands to be met by these emerging projects and virtual spaces, but a co-operative, co-existing conversation between screen-objects and non-screen-objects still seems contentious and rife with frustration. This is especially the case as the vogue of the identified netartist is quickly passing as evidenced by makers moving rapidly offline and (back?) into object making. This subject particularly peaked my interest through dealing with these issues in two shows I have recently helped curate or oragnize. Last month I worked with Bea Fremderman who runs Kunsthalle New down in Pilsen on a show called A Small Forest which consisted of work by four emerging artists all exploring delicate digital landscapes and the representation of the natural through the lens/influence of network technology. Although Fremderman and I already knew that we wanted to include Kate Steciw Water Rub/Protal floor piece in the show, but once we had begun our installation we saw that installing one spatial object amidst works either pushed back against the wall, or resting flat in print/projection, a fear developed that we might be misrepresenting or poorly portraying the work. Both of us knew how the selected works could maintain an intimacy that the framework of a personal computer provided, but when we brought these works into the space we were immediately confronted with how each work commanded a unique set of physical demands for installation and exhibition. In this way, I started to question what incentive I had for bringing works off the screen or away from a network into a more static environment; one that situated the immediacy of the work to it’s physical representation, and not to it’s ability to be constantly accessibility/hyperlinked. These variable points of accessibility between the spectrum of virtual and physical presentation shouldn’t be viewed as judgements of a work, but instead could be used as a metric for finding effective strategies for installing media art. 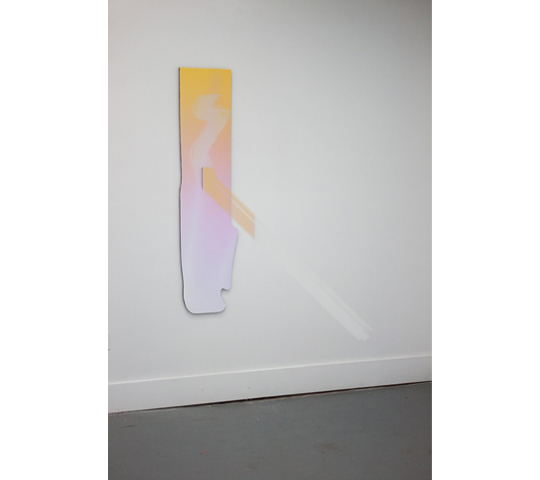 When formulating a show based around similar aesthetic and/or conceptual approaches the reality of the works in space immediately changed what I initially had seen as a direct conversation. Even the relocation of the works into separate media devices determined such a significant reconsideration of how the pieces worked together. Artwork contains a series of components that allow an idea to be translated visually. These components are broken down into the root-content, which refers to the subject of a given image; and a sub-content, which can be the image frame, the space surrounding, or the manner in which the piece is shown in relation to other works. Apart from the indexical, serial display of photographs in a space – which serves to obliterate that sub-content in favor of the portrayed subject matter – the inclusion of sub-content (a frame) can significantly help define and develop the concept of the image, and thus develop a complete object…. This is the same for all work, digital media included. Not all work must consider an alternate platform for presentation, but it is important to recognize the vessels through which media work may be presented through and the conceptual implications of such a gesture. I might be that because the dominating “sub-content” of media work – it’s technology of presentation – that I’ve struggled to find balanced ways to present online work within galleries. The presence of a projection amidst non-projected objects always presents a spatial problem due to the fact that projection not only operates on a flat surface, but also provides spatial awareness due to it’s throw. Thus, the “sub-content” of a projected piece starts to take president over the actual image-content/subject matter of a work. This is particularly the case with work typically shown online since the framing of a work is not only technological but also social. When the net already presents an alternative platform for showing and sharing creative content, media curators must understand how to re-situate the framing of this work to best suit content delivery. 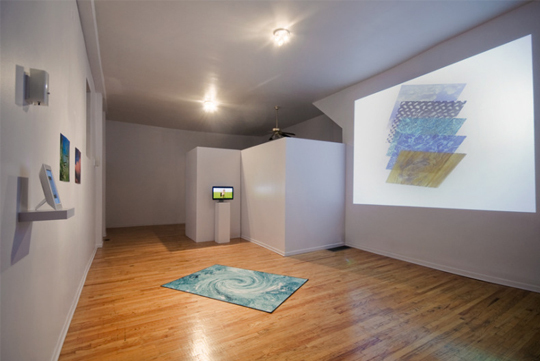 I noticed a hesitation in myself to rely on other non-media objects to galvanize a show for the purpose of spatial continuity since I had confidence that projection, screens, and computer based artworks could maintain that togetherness through a shared media-frame. Through these recent experiments in installation tactics, I found that there is an unexpected reliability and expectancy for physicality to substantiate a work – or else to give any ephemerality of a medium some sense of belonging within the gallery. 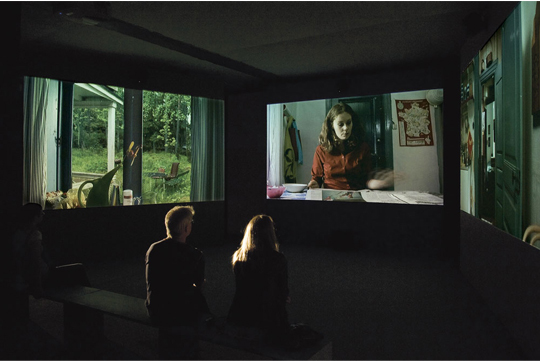 A common strategy that I’ve recently seen is to turn projection into more of an object has occurred in Eija-Liisa Ahtila‘s multi-screen installation of her work The House at the Art Institute of Chicago as well as a recent show curated by Scott Wolniak at Andrew Rafacz. In these instances, it appears as though the projected image cannot sustain enough attention and must be presented on a apparatus akin to a billboard in order to convince an audience of it’s uniqueness. 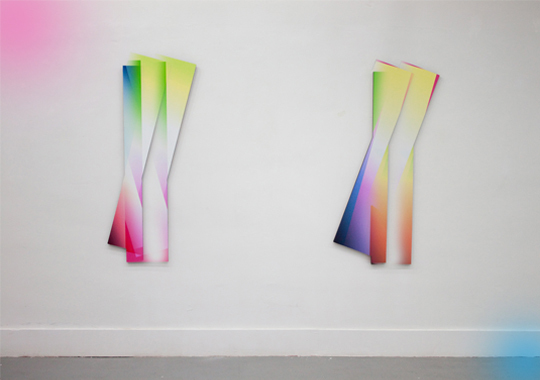 Perhaps through creative pseudo-site-specific installations of video screens and projected surfaces, the willingness to view the work as a unique object is more obtainable. My own willingness to surmount the novelty of technological pieces within a gallery is perhaps giving my audience to much benefit of the doubt. Although I am quite willing to allow for a media-only show to “stand-up” against those that contain no such work of that kind, curators and organizers from other backgrounds might not be as eager to mount a show exclusively comprised of media/screen artworks. This might also have to do with an unrelenting faith I have in the work that I want to show, and the dialogs I hope to create between works when presenting them in group exhibitions. For me, the power of the works have already surpassed a limitation of the framework in which they originate. I often don’t think of them as media work at all, or even work dependent on specific technology, but instead I consider them an amalgamation of ideas or concepts wrapped into visual casings. Installation obviously radically changes my perception of a work since the materiality of that presentation plays an equal role in any given works effectiveness. After working on A Small Forest I encountered similar spatial/installation concerns when working with Mike Ruiz and Adan De Le Garza for the mounting of a show at The Future Gallery in Berlin entitled Youth Culture. We quickly found that the media heavy show that Adan and I had put together could potentially turn into a stale cubicle of moving images without proper consideration paid to non-digital works acting as counters (or stabilizers) to works displayed on digital devices. 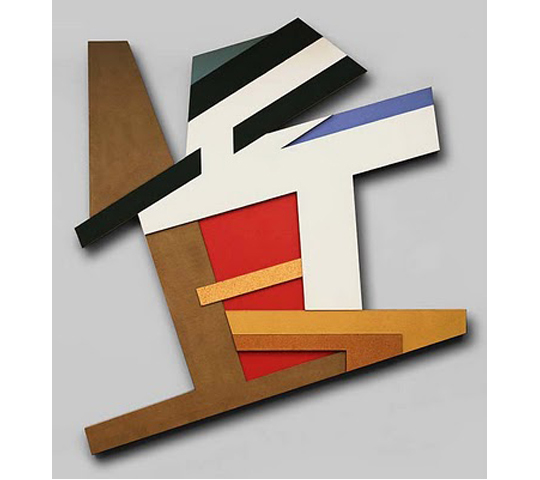 The sensitivity of this scenario was also crucial since the thematic structure of the show happened to incur similar aesthetic approaches that when paired in close spatial proximity to each other seemed dangerously visually redundant (i.e., works with faces/people, works with abstract geometry, etc.). The immediate concern was that if all the work existed within too obvious a framing then nothing would extend beyond the initial reception of a leaned or projected image against a flat wall/surface. We agreed that a sculptural object would interrupt the fear of a static show comprised of only wall-hanging objects, but whether projection and digital presentation necessitate the same sculptural balance for me was partial evidence of how media still exists in a state of unease within a gallery/fine-art context (even in spaces like The Future Gallery that specialize in showing media art). After several trial and errors we found a layout that worked well, giving non-media work space to breath, as well as utilizing the floor space of the gallery. However, almost a week after the opening, I’m still curious how my expectations of media installation within a space are being informed by the apparatus’ that are currently available. Perhaps this whole series of problems has something to do with the increasing readiness of smaller/DIY/apartment venues to have access and/or acquire equipment necessary to show media based work. Since so many younger artists are working between screen environments and physical spaces the integration and incorporation of media-objects into a show will not only become necessary but it will undoubtably become less cumbersome for curators. But what is at stake here is not just an acceptance that media-objects will become so common place in both museum and gallery contexts but rather that within this transition period (if one can call it that, since so many galleries already have media specific shows) an attempt at reconciling how media-objects not only serve as surfaces but also as spaces needs to become a more open conversation. In continuing a visual appraisal of works made in or around the web – be it by production, distribution, or influence – through connecting visual and/or conceptual proximity to works made in or around mid-century Modernism, Minimalism, and eventually Conceptualism, a new comparison has sparked my interest, even if it is only visual at this point. As a coincidence, I was watching a video of Frank Stella touring the Philip Johnson glass house around the same time that the Rhizome Commissions were announced. I was pleased to see Artie Vierkant among the recipients of this year’s grant for his Image Objects project, and was immediately reminded of some works from the Polish Village series painted by Stella which were influenced by architectural drawings of now demolished synagogues. 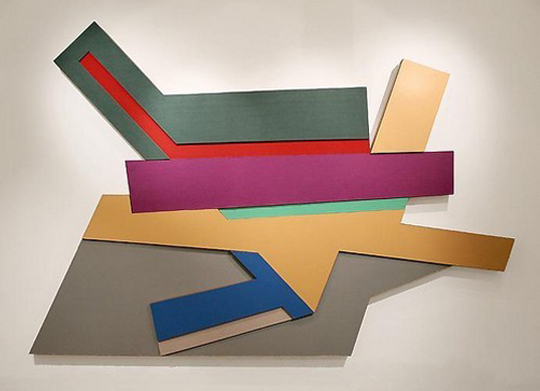 Each artist’s work are not only visually linked, but also conceptually apropos to their respective times. Stella wishes to explore the “built” aspects of painting through the architectural drawings of lost temples of the Eastern Blok, while Vierkant attempts to recapitulate the space of an online environment with a new-found physicality of “augmented documentation” found within the feedback between digital objects and analog spaces/installations. Although I haven’t fully thought out the connections that I’d like to draw between the two artists and these specific works, I couldn’t resist juxtaposing the works to highlight the resonance of practice and aesthetics between the two. The abundance of technology – and by this I mean The Digital – that surrounds us gives way to a new sight, one of lossy propriety and faulty compression. Spaces unwound by an interwoven hyperjunk; like gryphons and sphynx further mutilated by a falsely identified mass. Our vision is still handed to us. The absence of our senses is an obligation if we are eventually expected to use them. Sometimes, I wish I still had the balls to talk/write like this, but honestly, I’m not 100% sure what I’m even saying. re-found on Sean Cubitt‘s Blog.